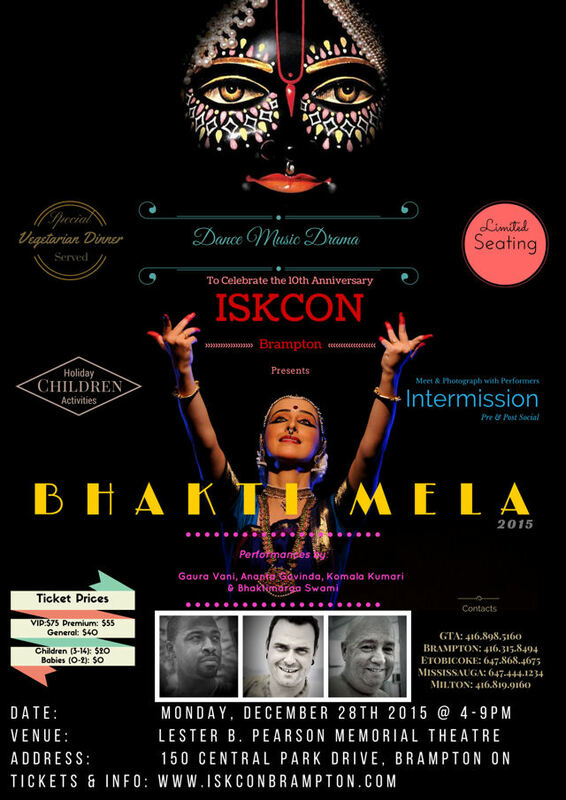 Bhakti Mela Event - December 28, 2015 ~ The Toronto Hare Krishna Temple! This holiday season, ISKCON Brampton invites you to a spiritual gathering that promises to invoke euphoric vibrations of your soul through Drama, Music and Dance. Please join us for an intimate holiday event, consisting of a spellbinding theatrical production by His Holiness Bhaktimarga Swami, enchanting kirtan with internationally renowned kirtaneers Gauravani and Ananta Govinda prabhus & mesmerizing bharatanatyam by Komala Kumari; A wonderful way to spend the holidays. No need to leave your children behind...separate children's activities to keep the younger attendees entertained too. A full vegetarian dinner and beverages will also be served. Parking is free and public transit is right at the door step of the historic Lester B. Pearson Memorial Theatre in Brampton. Dress in your best and walk the red carpet upon your arrival as you are greeted by our VIP’s and photographed for memorabilia. Interact with the theatrical performers during intermission while your taste buds are stimulated by the elegant vegetarian preparations from Govinda’s Restaurant in Toronto. Celebrate throughout the night with International talent who will not only entertain you but give you their association. Canada’s own Walking Monk will pull you along in his trails of theatrics as he conveys the many pastimes of Krishna. All of this while the Children will have the opportunity to engage in some of the cultural elements of the holidays; while being entertained by the finest wizards of magic and illusion. Don’t miss this opportunity to end your holidays on a spiritual high and journey that will kick start your resolutions into the New Year. Limited premium and VIP seating available.